This luxury condo being built is going to be a "full service condominium residence" and called "45 Province," probably because that is its address and they couldn't come up with a more imaginative name. 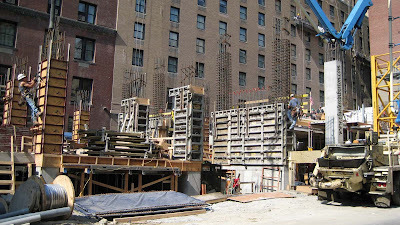 The light colored brick building in the background is the Omni Parker House Hotel, which is undergoing renovation. If you enlarge the picture you should be able to see workmen on the side of the building. The entire front of the hotel is covered with scaffolding and netting.